This project presented several challenges right from the start. The first was tying the new roof into three other roofs that have 12/12 pitch and directing water correctly out of valleys to the gutters on both sides. 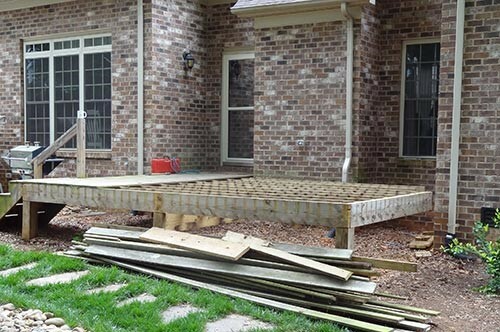 Another was eliminating the step out of the house onto the new porch and still maintaining code for the step risers from the porch to patio. 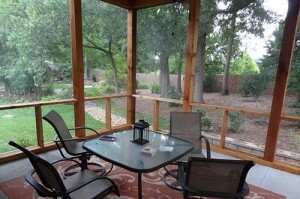 The newly built screened-in porch was to be as maintenance free as possible. Finally, the weather was a big factor since we had to open the roof to weather to frame the screened-in porch; it was a very rainy spring. We also had time pressure because of a hard completion date of June 26; the project began on April 27. 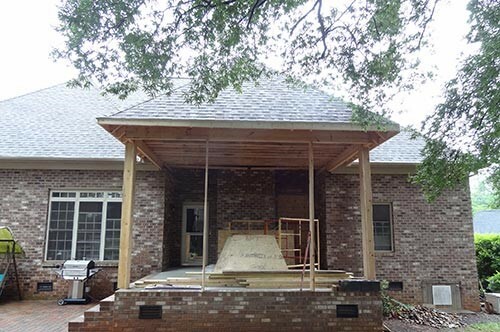 Before we started building the screened-in porch, we decided that all exposed wood was to be rough sawed cedar with 6×6 posts and 2×6 cross members, and 1” for finish boards. The screen was fiberglass 8’x50’ rolls, which is stronger for pets and still good for everyday use. 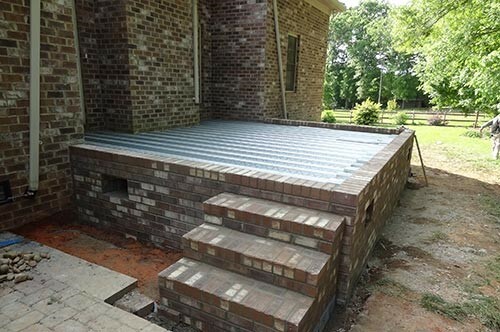 As with any build, it’s important to create a solid foundation and it was decided to go with brick foundation and a cement floor over an engineered-steel base. 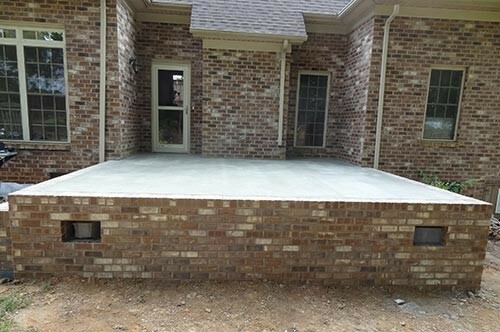 When we created the foundation we were able to remove the step from the house by pouring the cement level with the threshold from the house and slightly sloping down over three feet. While planning to build the screened-in porch, we unfortunately overlooked one item: Disposing of three truckloads of dirt from digging the footings. A large trailer was brought in and used for removal. 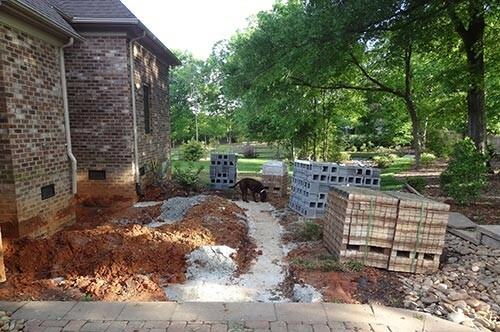 The foundation brick work was completed in four days, even with some rain every day. The engineered steel was placed and cement poured three days later. With the floor in place we could now start on the framing. One of the crucial items was to tie the new header into the house so it was supported and met code requirements. 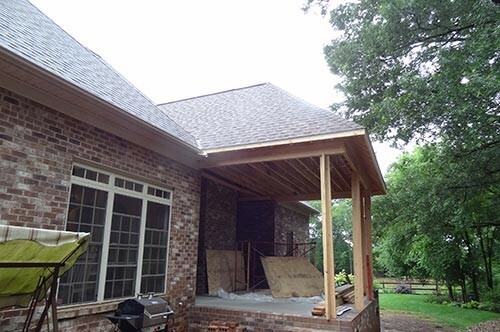 This entailed opening up the roof on the screened-in porch on both sides, which meant the wood framing of the existing house was exposed to the elements. Saddles were installed with a 12/4 pitch on each side of the new porch roof where the three roofs came together to direct water out of the valleys to gutters. 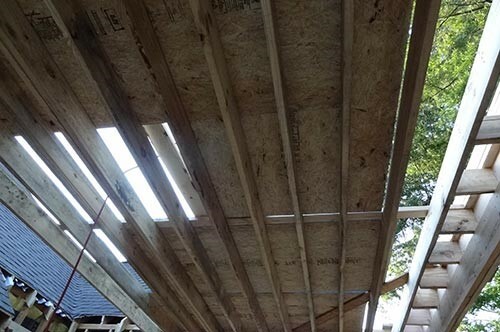 The framing took four days to compete and then tar paper was placed on the roof. Unfortunately, it rained heavily that night, and even with all precautions there was one spot that leaked and a wall of the existing house had to be re-taped and painted. Needless to say, we hurried and put the new roof on two days later and had no problem after that. 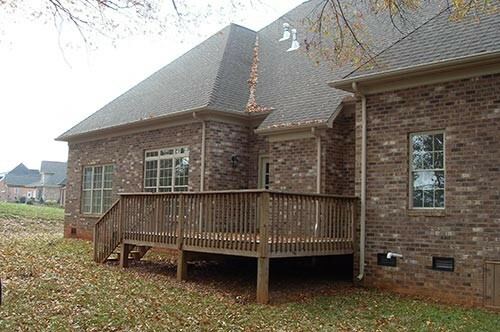 Once the roof of the screened-in porch was completed we placed the 6×6 post in the metal bases and fastened them at the top to header with 12” metal straps. 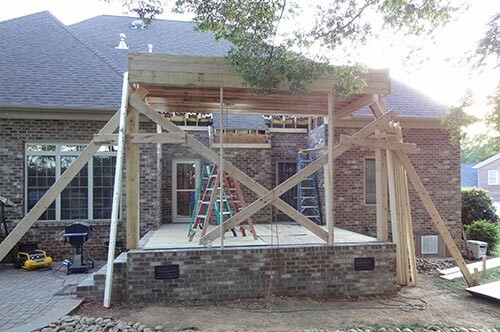 2×6 cross bracing between posts was placed at the top, bottom, and 30″ off floor. These were routed into 6X6 posts to prevent movement and warping. 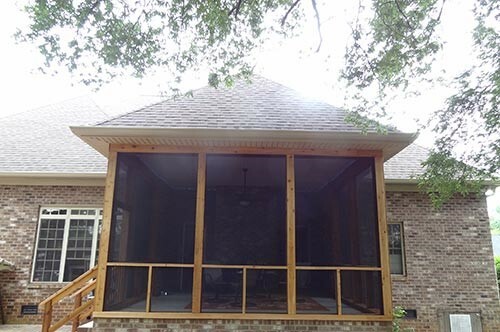 Screen material was fastened into place using a hammer staple gun and 1″ cedar boards were installed over all exposed surfaces on the outside and inside to finish. A clear sealer was used on cedar to protect it. A vinyl ceiling was installed, insulated to a R30 and electrical work completed with a ceiling fan and light. The project was a success and was completed after two months because we had to work through more than eighteen days of intermittent rain. I used my Bosch tools on this project and they were as reliable as always. Written by Gary A. Conrad. His life has revolved around construction of one type or another, and he always enjoyed working with his mind, hands and tools. He was involved with Local Home-builders Association as President and Board Member and served on the State Board for over 16 years.